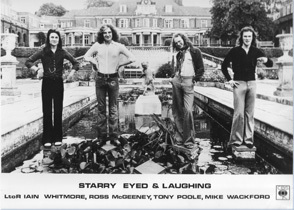 Starry Eyed And Laughing first played as a quartet at The Angel Underground, Bishops' Stortford on 30th Sept 1973, and 9 gigs later, received a glowing review in Melody Maker, the UK's premier music weekly. By the end of November, Steve Hall had decided to return to his studio, and Iain Whitmore joined on Bass, having learned the set whilst travelling with the band as a member of the road-crew. The start of 1974 saw them tipped for success by several music papers, and in March, CBS Records' Dan Loggins agreed a licensing deal with Panda - initially for one single with an album option. A few days before the sessions, Michael Wackford was recruited on drums, although - with their increasingly intensive gig schedule leaving little time for rehearsal - Nick Brown would graciously continue playing live dates until the begining of June. A legendary show at London's Roundhouse for Zigzag magazine's 5th Birthday Party with Michael Nesmith and John Stewart, and sessions on John Peel's BBC Radio show and London's Capital continued the momentum, as they toured colleges and clubs around the UK.